As I read up on all things SESAME STREET, one article mentioned that this year marks the 47th anniversary of the popular children’s program! I couldn’t believe it – where does the time go? Do you remember watching Sesame Street on your local public television station? Now, of course, they travel with the stage show Sesame Street Live. Isn’t it great that the characters come to life for children everywhere? I wish they would have had that back when I was a kid! In 1969 I was 8 years old already. By the time they hit the road – I had hit the road and lost interest in kid stuff. LOL! Who is your favorite Sesame Street character? I think most kids like Elmo the best (certainly since the Elmo doll sold out a few Christmases ago). My favorite… wow – I hate to admit it. I’m just gonna say it real fast… my favorite is Oscar the Grouch! I like the Cookie Monster too – but I like Oscar better. Why would I like him? I admire him because he’s not afraid to be a grouch. He lives in a trash can and he’s grouchy. You know what to expect. He doesn’t try to be something he isn’t – and I like that. A curmudgeon’s curmudgeon. Oscar should write the how-to book on how to be a grouch with grace. He’s a grouch, you know he’s a grouch, he’s okay if you’re not okay with that. He doesn’t put on airs or fake being nice. I wouldn’t have a problem inviting Oscar into my house. Cookie monster would not be happy at my house because I don’t keep cookies on hand – but I’d try to bake some real quick if I knew he was coming. Of course, the last batch would be burned. The last batch that goes in the oven always burn because I get bored with the process and forget about them until the smoke alarm goes off. Sigh. I got a photo taken in Branson on August 22, 2004 with an Elvis impersonator – it was snapped after the show, so he was not exactly spring fresh – but we get photo ops when we can. I’ll bet he never went to a gym – doing those shows is a workout in itself. You know what’s in my scrapbook along with this photo? One of his scarves – or whatever you call those sweat catchers… eeeewww. Funny story though – I was so short there’s no way I could have caught one before all those tall girls – so my sweet hubby jumped up and got it for me – then handed it over. Teamwork – yep! Who thinks that real life is just overwhelming right now? I’m raising my hand! Seriously, there have been NO positives in the news and even though someone is running around saying America will be GREAT again, well… never mind. I’ll tell ya what, I’ll believe it when I see it – let’s put it that way. So when real life gets to be too much, what do we need to do? That’s right – we need to have fun and laugh. And guess what I have today? Yep – my friend John Coyote made a YouTube video – another Elvis tribute – but I gotta tell ya – this one is a hoot! But John’s voice does have an Elvis-like quality – but the dramatics along with it are too funny! And honestly, I didn’t even know Elvis recorded this song – I think the first time I heard The First Time (lol – that was confusing) – was when it was sung by Roberta Flack. I had the 45 record of it, so of course that’s the one I’m most familiar with. Of course, John would know for sure because I think he’s older than me (LOL) – yeah – he’s probably not – I’m just a music illiterate. Don’t hit me, John! Yee-Haw! April is Holy Humor Month!!! In case you think that Christians get baptized in lemon juice and are instantly left with no sense of humor… I’m here to say yeah, we know how to laugh. We’re more picky about what we think is funny, but we definitely know how to laugh! What did the 0 say to the 8? Oh I laugh every time I think about it. Especially because it was told to me by my 8 year old nephew and I didn’t get it at first. Once I did I couldn’t stop laughing. 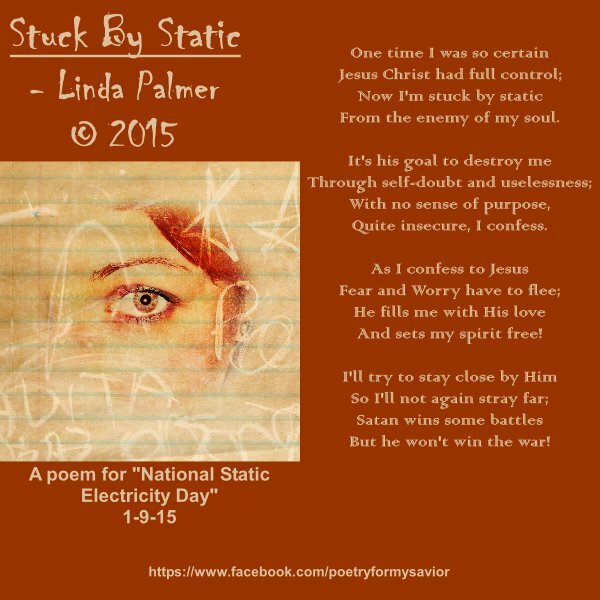 We love Lucinda’s poetry, but this back story is too cute! – Alligators….stop nibbling on fellow passengers. – Flies….quit pestering the horses. – Elephants…..shovel up your own mess, it blocks the hallways. – Pigeons….the lions are not statues. – Mosquitoes and bats….quit biting the other passengers. – Myna birds….stop repeating everything you hear. – Cows….fly swatting is prohibited. – Lightning bugs….remember lights out at 9 PM. – Pigs…..clean up your room. – Raccoons….stop your midnight raids. – Hyenas….stop laughing at the other passengers. – Bugs….stay out of the pantry. – Snakes….pick up your own skins and throw them away. – Ants….bring your own picnic lunch next time. – Hoofed animals….please tiptoe after midnight. – Camels….no spitting at the other passengers. – Squirrels….quit hiding nuts in the bathtub drains. – Night Owls….keep your hooting down, it keeps the Morning Doves awake. – Turtles….your dinners are getting cold, start for the dining hall earlier. – All passengers…. be careful what you say around the parrots if you don’t want it repeated. And what of Rex??? Did he miss the boat? Awe… no room! True story. My husband was on patrol one day and clocked a speeder. He stopped the young man and asked if he knew how fast he was going. The quick-thinking gentleman said, “Officer, you’re not going to believe this, but I hit a skunk a few miles back and I’m trying to outrun the smell.” He got off with a warning and my husband had a great story that he told time and again. I don’t recommend using this story – it doesn’t always work. LOL! I’m not Catholic, but as I was looking through posts on Pinterest, I spotted some outright funny stuff that even a Protestant can understand… This is my favorite – we should ALL be the one who makes others feel special… sweet! OH… surely not. Is there an initiation ceremony??? It was quite a sight to see snow on Easter morning, but isn’t that just like God? You know, when I taught Sunday School, my favorite lessons were object lessons. Maybe it’s because I’ve always been a visual learner. You can talk me to death, but until I see something and have it click in my own mind, talking just doesn’t do much good. Don’t make me read boring statistics either, or you’ll lose me completely. I believe God sent that snow to remind us that on Easter, the plan of Salvation was completed and He is more than able and willing to wash our sins as white as snow. and done things that have hurt you. from what is wrong in my life. I want to go where you lead in the future. so that I might be forgiven. Come in to be with me for ever. I’ve lived on this planet for nearly five and a half decades… and believe me when I say I’ve had my share of AWKWARD moments! With every one of them, I’ve learned to shake it off and move on as I laugh (and pee a little…) sorry – TMI. There’s a reason that Taylor Swift’s song, Shake It Off resonates with the masses. We’re all too human and that means we are not perfect, which means that at times we are all awkward and experience awkward moments. The good news is – our awkward moments in life are not life-altering. We know that God works ALL things for our good – and by all, I mean – ya know… ALL! That’s why we must not give up – on anything! We have to remember that every day will not be filled with roses and violin music! If it was, we’d have precious little to share in the way of life experience – let alone, things to look back on and have a hearty laugh! Some things make us more human, and the humanity is the part that we all have in common. It makes us more relatable to one another. So, with a humble heart and blushing cheeks, I share my most awkward moment in ministry. I wouldn’t trade this day for anything, yet I definitely would not like to relive it either. Only one life, so soon ’twill be past. Only what’s done for Christ will last. There can be – shall I say, “awkward moments” along the way. We know that God leads the way and He gave us many safe trips for sure! Awkward moments happen though – with people and situations. From the mid 1980’s through the mid 1990’s, my husband and I were part of a gospel quartet. We spent time traveling around and ended up in a small town in Kansas for a Sunday evening service. I decided to wear blue jeans and a tee-shirt for traveling, certain that there would be a place to change my clothes. When we got to the church, we got all set up and was ready to practice to adjust the sound and so forth… I casually looked around the small church, but did not see a restroom. I began to panic a little and pray a lot. I needed to put my dress on for the concert. About that time, the pastor walked in – all smiles. I was nearly in tears. I was embarrassed to ask, so had my husband ask if there was a restroom. When my husband came back to tell me – I could tell by the look on his face – this was not going to be good. The restroom was an outhouse. Yep – and that’s where I changed clothes. I got ‘er done, folks! Dignity intact, I’m happy to report. Then we played a few more songs in the sanctuary – and noticed a scraggly old dog had walked into the church. He decided to lay down in the aisle and listen. We played one song – then the dog got up, turned around and walked right back out the door. LOL!!! It’s NATIONAL STATIC ELECTRICITY DAY!!! Trust me, (the one with baby-fine blonde hair…), I’m well aware of the effects of static electricity! At my birthday parties, my friends thought it was funny to rub a balloon on the carpet and hold it above my head – just to see my hair magically FLY… well, what are friends for? Positive and negative forces, huh? Well, the positive force was making my hair stick to the balloon… but the negative force was when I punched their arms for doing it. Wait… did I type that out loud??? Oops! Well, that’s ok – I hit like a girl! I can usually explain things after researching them – usually. If you need a scientific explanation for static, I can’t provide that. I read and understood for the most part, but just in case I don’t understand completely, I’ll just leave some links for you to visit – how about that? OK, now that we’ve taken care of the technical stuff, can we get down to the FUN stuff? Thank you! We do have fun with static, but can these experiments relate at all in real life? I think we can learn a lesson from them. You knew I’d say that, right? Some days we feel stuck in life because of fear and worry. These best friends always travel together. They are used in an effort to emotionally blackmail God’s children by the enemy of the soul – Satan. I don’t like to waste a lot of my precious time talking about him or his sneaky ways, but it’s good to know when you’re getting spiritually stuck – and where the static is coming from – or more to the point, from whom it is coming. If I mess up and I fear doing it again, that could paralyze me. That in itself makes me feel miserable enough, but if I begin to worry about messing up again, I’m nearly defeated. Do you see what I’m saying? It’s a cycle – a vicious, pointless, waste of time. But, if Satan can make us waste enough time beating ourselves up, he’s keeping us from doing good for others and serving God. That’s worth his time. Enough about the negative – what do we do about this cycle that has the potential to defeat us? Pray the pain, fear and worry away! Ask God’s Holy Spirit to remind you of who you are – in HIM – not who you are compared to another pianist, or another writer, or another Sunday School teacher. Ask Him to remind you once again who you are – in HIM? If you do that, He will remind you that you are HIS. You are His very special creation – not because you have certain abilities or talents – those came from HIM to begin with! He wants you to know you are His child and He loves you. That puts everything back in its proper perspective.